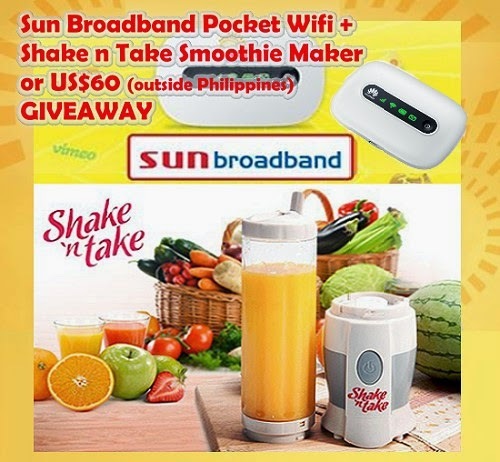 Sun Broadband Pocket Wifi plus Shake n Take Smoothie Maker Giveaway event is OPEN WORLDWIDE. 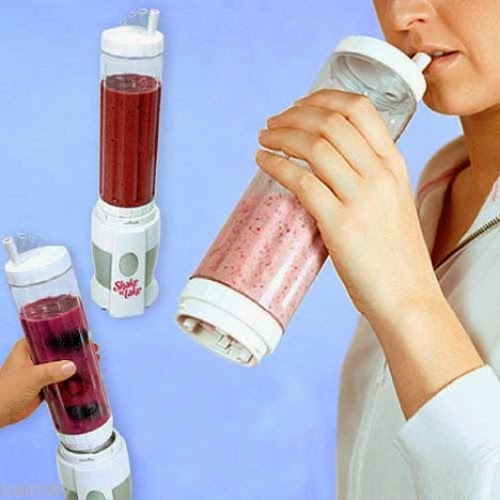 SHAKE N TAKE SMOOTHIE MAKER Specification: What separates the Shake 'n Go Smoothie Maker from other blenders is the fact that it's so easy to use. Simply put your fruit or vegetable slices into its jug and add water, milk, or yogurt. Then, close its lid, and press the "on" button. The strong motor on the Shake 'n Go Smoothie Maker will power its stainless steel blades that are attached to the bottom of the bottle. In just a few seconds, you can get a beverage that's smooth, delicious, and nutritious. 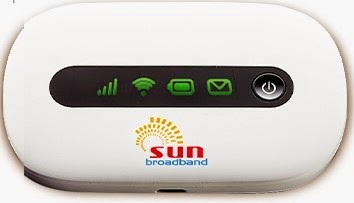 Sun Broadband Pocket Wifi Specification: The Sun Broadband Pocket Wifi is a HUAWEI E5220 that works with GSM networks. Specifically, it offers HSPA+, HSPA, and UMTS at 2100Mhz and 900Mhz, as well as EDGE, GPRS, and GSM at 850Mhz, 900Mhz, 1800Mhz, and 1900Mhz, and the unlocked version can be used with any carrier that offers these serivices and frequencies. There is no support for LTE. Up to 10 different devices can connect simultaneously over Wi-Fi b/g/n. Disclosure: I received no compensation for this Giveaway Event. Newly Crunchy Mama Of 3] is NOT responsible for shipment of the prize . This event was organized and hosted by Filipino Recipes Portal please contact PinoyRecipe.net with questions or if you want to be featured on our the next Giveaway event!